Back when we wrote about Trunk Club in 2009, the startup was an innovative new way that men could hire their own personal shopper via Skype video sessions, who try to figure out what kind of clothes they wear, what is lacking in their wardrobe, and what kind of clothes they might be willing to try. Similar to a retailer, Trunk Club sent desirable, stylist-picked clothes to gentlemen, which they tried on for stylists via Skype. The gents and Trunk Club stylists then nixed the clothes that didn’t work and the men were only charged for the clothes that they kept. Unfortunately, there were major problems with this model. Trunk Club was built around a loose network of contractor stylists all over the country who were paid on commission only. Product was then drop-shipped from wholesalers. The disjointed and fragmented model ended up being a customer service and quality control nightmare. About one year ago, an investment firm funded the company and brought on a new CEO to breathe new life into the company. The firm’s choice was Brian Spaly. You may remember Spaly from Bonobos, a recently-funded startup that makes custom-fit pants for men. Spaly and Andy Dunn founded Bonobos together and clearly didn’t part ways on the greatest terms. Spaly simply says that his vision of Bonobos diverted from Dunn’s, which is why he left. 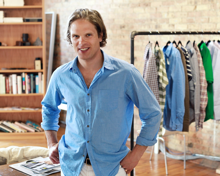 So shortly following his departure from Bonobos, the investment firm pitched him on the Trunk Club opportunity and he quickly realized that there was greater potential in the model with a few simplifications. First, he centralized Trunk Club in Chicago and eliminated the disparate network of stylists from around the country. Instead of Skype chats, professional stylists on staff who are based in Trunk Club’s Chicago offices, coordinate with clients via phone and email. As Spaly tells me, some men want to spend 20 minutes talking about what they need in their wardrobe and some men prefer to coordinate their picks over email. Second, Spaly focused the company on a particular genre of clothing—nights and weekend style, or “smart casual.” Inventory includes jeans, casual pants, sweaters, polo shirts, jackets, t-shirts and shoes. Designers range from Penguin to Lacoste. And all of the clothes Trunk Club ships and sources are stocked in a massive store room in the startup’s Chicago offices. In terms of the sourcing of clothing, business model is the same as a retail store. The Trunk Club buys clothing at wholesale and sells it at a normal retail markup. There are no sales/discounts on clothes and Trunk Club stocks its own inventory. Customers don’t pay anything extra for them as they would in a fancy department store. So how does it work? A gentlemen can sign up via the website, pick preselected looks, and answer a small questionnaire with questions like “where do you shop right now?,” “what’s your favorite item in your closet,” sizes, price and color preferences and more. A stylist will then call/contact the customers via their preferred method of communication. Once the stylist gets an idea of the customer’s style, he or she will send a “trunk,” of clothes and ship out via Fedex a handpicked collection of shoes, pants, shirts, and more. Once the customer receives the order, he can try on the items and send back the clothes he doesn’t like in a prepackaged box. The customer is only charged for the clothes he keeps and isn’t charged for any shipping costs. Outside of of Illinois, customers don’t pay sales tax either. Spaly says that some customers, both Chicago-based and outside of Chicago, prefer to visit Trunk Club’s offices to try on and pick clothes as well. Speaking purely from a personal standpoint, I know this model would work for my husband, Suneel. He works long hours, wears old t-shirts, threadbare hoodies and ripped jeans to work, but likes to look decently put together when we go out for dinner. But he hates to go shopping and doesn’t even really have the patience or time to peruse online retail sites. With Trunk Club, he can get the clothes he likes, hand-picked by a professional stylist, shipped to our front door, and I can pick which ones look best from the comfort of a couch (because, as his wife, I get final say). Trunk Club is the perfect solution for him (and me). But Trunk Club is not for everyone. Some men may prefer being able to try on clothes in-stores. Or others may want to be able to find clothes on sale (Or others may not have overbearing wives, like me). And certainly the type of clothing that Trunk Club offers requires customers to have an expendable income. But it does present men with a relatively painless and less time-consuming way to shop. And this seems to be a fairly growing demographic if sales are any indication. Spaly tells us that in 2011, the startup is expecting $5 million in sales (that’s up from basically nothing a year ago), and is on the path to profitability. The average transaction size is anywhere from $500-$850, and the company is pleased with repeat purchase rates. The company previously raised $1 million in capital and is looking to raised a larger venture round now to support its efforts to possibly expand into new geographies. While Trunk Club’s 1,900 customers are located all over the country, Spaly is considering opening up satellite offices in cities like Atlanta, Boston, Dallas and San Francisco. There’s no doubt that as technology advances, shopping is taking on new forms and models. For example, J Hilburn is also creating a unique retail experience for men with designer-like customized shirts. I anticipate that we’ll see many more startups, like Trunk Club and J Hilburn, that not only aim to bring the shopping experience online, but also save the customers (and their wives) time and in some cases, money.